Home Headlines Eternal War and Hotel Imperator, Two Awesome New Expansions for Mutant: Year Zero Fans! Eternal War and Hotel Imperator, Two Awesome New Expansions for Mutant: Year Zero Fans! 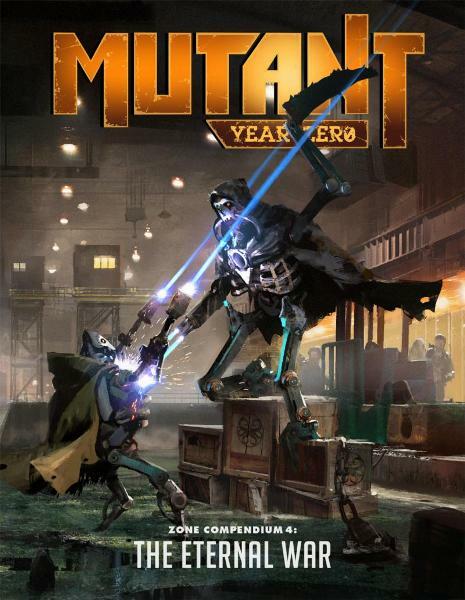 Today we’re really pleased to announce the release of two new awesome Zone Compendiums for the Mutant: Year Zero RPG, Eternal War which complement the recent release of Mutant: Mechatron and the original Mutant: Year Zero game. Both are available in print and PDF as part of our Mutant: Year Zero Collection on Modiphius.net, and are also available on DriveThruRPG.com. In the dimly lit room, serious-looking men and women sit around a long table. At the short end, a man with long silvery hair and wearing a black suit presides over the meeting. His left eye lacks both iris and pupil, the white of it tinged by an unnatural icy blue. An old machine on the table projects a photo of a scrap village on the wall. The door to the room opens. Two people enter, cloaked in shadows. Hotel Imperator. The mysterious Brain Ring has established its headquarters in an ancient hotel. What are the psionics’ nefarious plans? The Long Road. A nomadic tribe of mutants travel through the Zone. What can the player characters learn from them? The Zone Fair. A robot has reopened an ancient amusement park in the Zone. What dirty secrets do its visitors bring with them? The Great Zone Walker. A colossal machine is rumbling through the Zone. Who controls it, and where is it going? We hope you enjoy these two brand new releases which expand the award-winning Mutant: Year Zero even further, and look out for more great releases coming soon!